Maverick Audio TubeMagic DAC lets you “upgrade” the audio listening experience for any type of setup. Whether you currently have a computer, game console, CD player or Squeezebox, simply plug the TubeMagic D1 in to enjoy superior high end sound quality. From 16bit to 24bit, from 44.1 kHz to 96 kHz, TubeMagic D1’s professional-level Audio DAC produces an extremely accurate and distortion-free digital-to-analog conversion. Your digital music files have never sounded this good before. Without a good analog stage, even the best quality digital music will sound dry and lifeless. After all, music will only be played in analog format via amplifiers, speakers and headphones. We spent a great deal of time to enhance the analog circuit to make sure the analog signal will sound natural, transparent and full detail. The TubeMagic D1 comes with a vacuum tube pre-amp output stage in addition to the normal solid-state audio output. Powered by a vintage vacuum tube made in 1970’s, it adds a lot of warmth and smoothness to the music, especially to Vocal and Jazz genres. Furthermore, you can use this DAC as a full functional tube preamp, adding the “tube magic” to the two analog and three digital inputs. A damn good Headphone Amplifier! With up to 600 ohm impedance and 1000mW power output, this DAC has enough power to drive any headphone on the planet. Do you want to listen to your iPod with brilliant clarity? Simple. The TubeMagic DAC comes complete with a cord and front panel line-in jack for your iPod or other MP3 player. Just plug it in and you’re ready to rock. R-Core transformer is a super-regulated power circuit that purifies and enriches the digital-to-analog conversion bringing extremely pure, natural and detailed music output. 100% handmade with audio grade components topped off with a brushed aluminum front panel. We make sure this baby is a serious audio equipment. Two digital sources (optical and coaxial) means that network music devices, media players, games consoles, CD/DVD players etc. 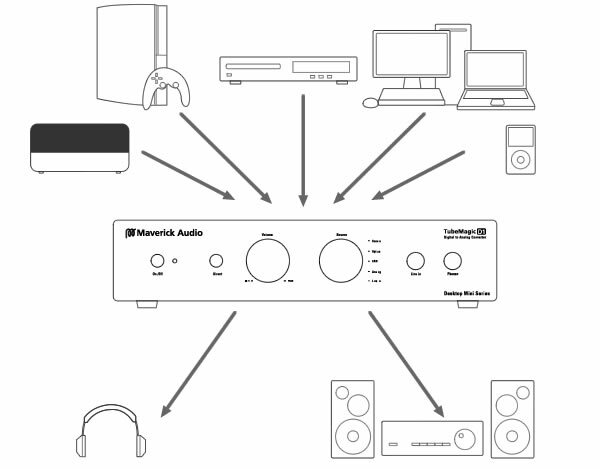 can be connected concurrently using S/PDIF (Coaxial) or Toslink (Optical) inputs. Two analog sources (one line-in on the front panel and one analog in on the back) means that iPods, portable music players, vintage audio equipment, or any audio device without digital outputs can be connected concurrently using the 1/4″ or RCA input. Additionally, you can connect the TubeMagic DAC directly to your PC using a USB connection (no drivers needed) and dramatically improve the quality of your digital music. Do you want to listen to your iPod tunes in any room? Simple. Your Squeezebox Radio comes complete with a cord and built-in jack for your iPod or other MP3 player. Just plug it in and you’re ready to rock.